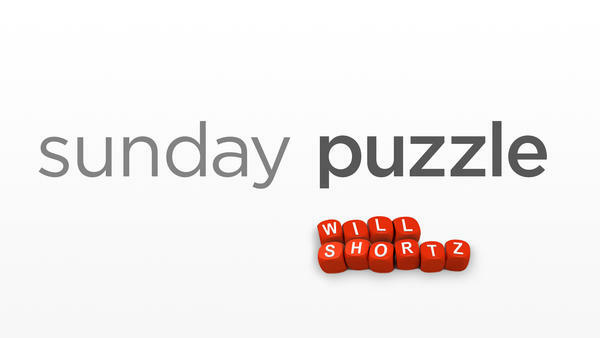 Last week's challenge: Think of an article of apparel in 5 letters. Change one letter in it to name another article of apparel. Change one letter in that to name a third article of apparel. Then change one letter in that to name a fourth article of apparel. The position of the letters you change are different each time. What articles are these? Next week's challenge: This week's challenge comes from listener Mark Maravetz of Albuquerque, N.M. Take five consecutive letters of the alphabet. Write them in left-to-right order. Insert five letters at certain spots. These will all go between the first and last given letters. The result will be a famous actor — first and last names. Who is it? If you know the answer to next week's challenge, submit it here. Listeners who submit correct answers win a chance to play the on-air puzzle. Important: Include a phone number where we can reach you Thursday, March 2, at 3 p.m. ET. Here in D.C., we've swapped out our sweaters for short-sleeved shirts this week with record-high temperatures. There's only one thing I can think of more perplexing than this unseasonably warm weather and that is, of course, The Puzzle. GARCIA-NAVARRO: Have you been enjoying some of the early spring weather? SHORTZ: Sure have. Man, it's nice to walk around town without a heavy coat on. GARCIA-NAVARRO: It's good because I think last week's challenge was about an article of apparel, so remind us what it was. SHORTZ: Yeah, I said think of an article of apparel in five letters. Change one letter in it to name another article of apparel. Change one letter in that to name a third article, and then change one letter in that to name a fourth article of apparel. And I said the positions of the letters you change are different each time. What are they? Well, my answer was shift to shirt to skirt to skort, S-K-O-R-T, being a portmanteau between skirt and shorts. SHORTZ: And of course, the answer can go the other direction as well. GARCIA-NAVARRO: We received nearly 1,500 correct responses, and this week's winner is Ed Roberts of Spring Prairie, Texas. ED ROBERTS: Hello, Lulu. And it's warm down here, too. In fact, I put some tomato plants in the ground already because they say down here once the mesquite tree blossoms, there will be no more frost. So we're going to test that legend. GARCIA-NAVARRO: That's amazing. Tell us a little bit about Spring Prairie. ROBERTS: Well, it's a small little town - no stoplights, no stores. And we have to use a post office in Rosanky, which is six miles away. More horses and cows than people, but it's quiet and you can see the Milky Way at night. GARCIA-NAVARRO: Well, you are our guest contestant this week. Are you ready to play? ROBERTS: I'm ready to try to play. GARCIA-NAVARRO: (Laughter) All right, here we go. SHORTZ: All right, Ed and Lulu, I'm going to give you three five-letter words. You tell me a five-letter word that can precede each of mine to complete a compound word or a familiar two-word phrase. For example, if I said draft, house and rider, you would say rough, as in rough draft, roughhouse and Rough Rider. SHORTZ: And you're always looking for a five-letter word. Here's your first one - glass, slide, melon. What can go in front of glass, slide and melon? SHORTZ: Water is it, good - water glass, waterslide and watermelon. Count, donor, sport. SHORTZ: That is it. Nice. SHORTZ: Sense - yeah - sense, S-E-N-S-E, power, laugh. ROBERTS: Power. P-O-W-E-R? The second word? ROBERTS: It's not common sense. SHORTZ: Good job, Lulu. Horse sense, horsepower and horselaugh. Here's your next one. ROBERTS: We have horses out here. I should have got that one. SHORTZ: You have a lot of horses - shift, shirt, stand. SHORTZ: That's it, good. Tease, T-E-A-S-E, poker, steak, S-T-E-A-K.
SHORTZ: There you go, strip poker. GARCIA-NAVARRO: (Laughter) You got that pretty fast, sir. ROBERTS: It can't be tall because that's only four letters. SHORTZ: Yeah, what's the opposite of that? SHORTZ: There you go - short story, short order, short range. How about sauce, S-A-U-C-E, cider, C-I-D-E-R, and store. ROBERTS: Oh, that's going to be apple. SHORTZ: Apple as in Apple Store. And here's your last one - blank, guard, G-U-A-R-D, and taken, T-A-K-E-N.
ROBERTS: Not safeguard. Taken, blank - draw - not draw a blank. SHORTZ: ...And point taken. Nice job. GARCIA-NAVARRO: That was great. Congratulations. ROBERTS: I needed help. Little help from my friends there. Thank you. GARCIA-NAVARRO: (Laughter) For playing our puzzle today, you'll get a WEEKEND EDITION lapel pin as well as puzzle books and games. You can read all about it at npr.org/puzzle. Ed, what member station do you listen to? ROBERTS: I listen to and am a member of KUT FM 90.5 here in - and they're in Austin, Texas. GARCIA-NAVARRO: That's what we like to hear. Ed Roberts of Spring Prairie, Texas, thanks for playing The Puzzle. GARCIA-NAVARRO: All right, Will, what is the challenge for next week? SHORTZ: Yeah, it comes from listener Mark Maravetz of Albuquerque, N.M. Take five consecutive letters of the alphabet. Write them in left to right order. Insert five letters at certain spots - and these will all go between the first and last given letters - and the result will be a famous actor, first and last names. Who is it? So again five consecutive letters of the alphabet in left to right order. Insert five letters at certain spots to name a famous actor. Who is it? GARCIA-NAVARRO: When you have the answer, go to our website, npr.org/puzzle, and click on the Submit Your Answer link. Just one entry per person, please. Our deadline for entries is Thursday, March 2, at 3 p.m. Eastern. Please include a phone number where we can reach you at about that time. If you're the winner, we'll give you a call, and you'll get to play on the air with the puzzle editor of The New York Times and WEEKEND EDITION's puzzlemaster, Will Shortz.